You probably log server side exceptions and other events using a logging package such as Log4Net, Elmah, or NLog. Fix this by installing JSNLog. It automatically logs client side exceptions to your server side log. JSNLog sends the log data to the server and into your server side log. Your logs now have both the server and client side events. You can correlate them with request ids. Supports IE 8+, Firefox, Chrome, Opera, Safari (desktop/mobile). Use stand alone, as an AMD module, ES6 module or CommonJS module with Browserify, or with bundles. Available on cdnjs. Use as an ASP.NET Framework HTTP Handler or OWIN Middleware Component. Or as an ASP.NET Core Middleware Component with .NETFramework 4.5.2 or .NETStandard 2.0. Fully documented: API docs, examples, how to's, videos. // will actually be logged. Great if your site is used on mobile devices. But you don't want to send trace messages with that context unless there actually is an exception. 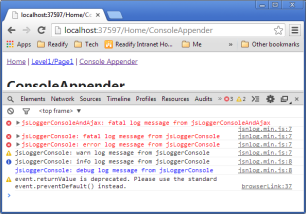 Solution: JSNLog lets you buffer log messages on the client, and only send them when there is a fatal message. Switch console logging on or off in one central location.